Have a clear plan about what you want and set a deadline. Contact recommended tradespersons and ask for a quote (this will involve a site inspection and may incur a cost). Ask for an obligation free quote. Agree on estimated price, start date and foreseeable finishing date. Sign a document together outlining this. If there are changes or unforeseen costs, agree on this and sign a modified contract. Check all goods on delivery for correct colour, size and quantity. If you have concerns or complaints, contact the Consumer, Trader and Tenancy Tribunal on 1300 135 399. Paving around the house is increasingly popular and within reach of most home handy-persons. Unlike house bricks, which are generally sold by the thousand, pavers are usually sold by the square metre (usually shortened to metres squared). 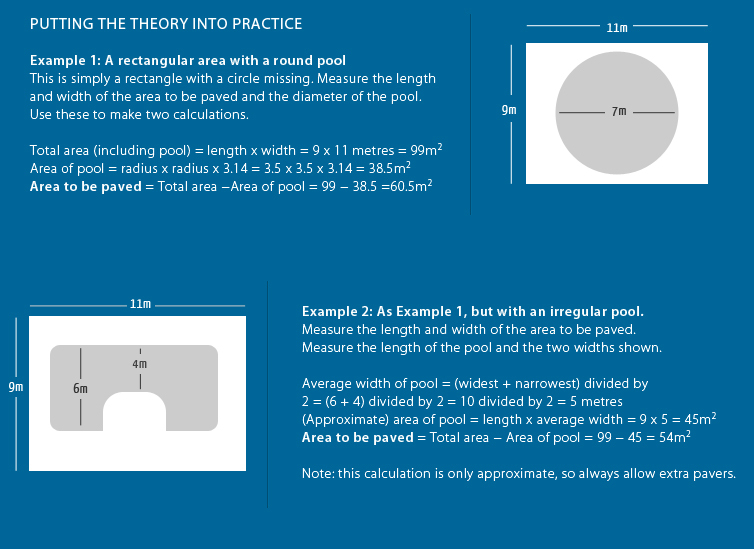 The following examples (insert taken from CBPI Techniques 02) will enable you to accurately calculate the area to be paved. 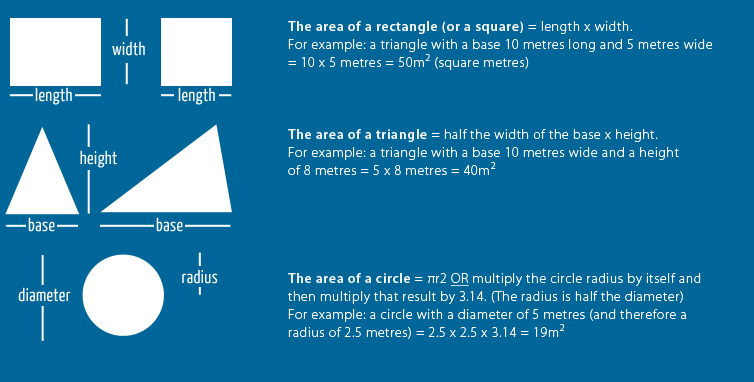 Most areas are one of the other (or a combination of both) of the three basic shapes: rectangles (including squares), triangles and circles.